First, our winner of Cheryl Wyatt's A Soldier's Reunion is Lady Glamis. Congrats! E-mail me your snail mail and I'll get this out to you. Finally, I just want to say how honored and excited I am to "talk" with you all. Really. Not everyone has a dream. I know people who, when asked, don't know what their dreams are. A vision, and dreams are so wonderful and I love sharing this journey with all of you. If someone asked you what your dreams for the future are, would you tell them you want to get published? Or do you have other dreams besides this rollercoaster adventure? One more giveaway for this month, and it's for Cheryl Wyatt's most recent military romance A Soldier's Reunion. As soon as I began reading this story, I was struck by the plot and its similarities to my manuscript The Bridegroom's Revenge. The main characters were childhood friends, high school sweethearts (like mine). Our heroines deal with abandonment issues. There's interfering parents and of course, both stories are reunion romances. So I studied this one closely because I figured I could learn some stuff. And I did. Wyatt did an awesome job of SHOWING how the characters had never forgotten each other. The hero (AKA Mr. Buff Pararescue Jumper) remembers how the heroine takes her coffee. Isn't that romantic? And the heroine hasn't removed the necklace Mr. Buff PJ gave her in high school. This is just a tiny, mini-rant (no rage involved), and it's regarding Christian Fiction. All of the men seem a little too....nice. I know, I know, Beta males are the helpful guys, right? But shouldn't they still have some sort of Man quality. You know, the thing that makes a woman shake her head, snort (you know you do it) and think, "That's just like a man." Remember those old romances, where the man was almost to the point of jerkiness and the woman was either a fiery wildcat or a gentle waif? Things seem to have switched now, to where the woman is self-involved and controlling, while the man is a cowering, apologetic...thing. I'm always disappointed when an author debuts an incredible book, but subsequent books lack the intensity of the first. Or when I have a favorite show that gripped me for the first few seasons, but then suddenly the show's writers fall back on cliched scenarios and contrived conflict. That annoys me. Alas, I have discovered to my horror that I, too, have become a lazy writer. I studied when I was a newbie. I gulped down craft information for hours on end. But now, in my rush to write, some of these precious gems have fallen to the wayside. Thank goodness for a crit group. So I "tell" a little too much in my writing. I was lazy and it was easy to do. Now I'm buckling down, ready to sweat out some "showing". When you get lazy, what part of your writing is the first to get flubby? On the writing front, I received a rejection on a partial. All the more stimulus to get to work on my revisions. How's writing going for you? Normally I don't read Amish fiction. I used to, before I started writing, but then I stopped because the same character's story would go on for six books and I'd get frustrated. Or I wouldn't be able to find the next book in my teeny weeny library. A few months ago I tried again to read some bestselling authors' Amish fiction. I was very, very bored. 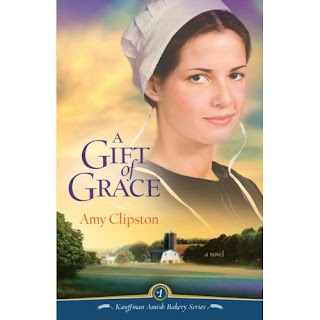 So when I picked up fellow writer Amy Clipston's debut novel A Gift of Grace, it was with trepidation. I really wanted to like her story and was afraid I wouldn't. Her book put my fears to rest. I really got caught up in the story. Her writing was smooth and her characters real. Their conflicts interested me and made me want to read more to see what would happen. In particular I felt a real empathy for the character Jessica (lol, not because of the name either). I feel like I would've struggled with all the Amish rules like she does. Also, she has recipes in this book. It's a pretty cool touch. but I hope I'm just a very thankful, blessed woman. This time I'll try to grab some pics while I'm there. Not only that, I just discovered, to my almost eternal bliss, that my computer has wi-fi!!!! Yay! So I will have internet, though I might only be able to check in once in awhile. You know how when you go to the hairdresser and you tell them you just want a bit cut off, and then the stylist goes wild and chops off five inches? This can happen to your manuscript. By you. See, we're not supposed to flood the beginning of our manuscript with backstory. I learned that tough lesson with my first completed manuscript. So what did I do on my second? Cut out all backstory, jumped right into the action and finaled in a contest. But I didn't sell because the loss of backstory, the loss of me sitting and thinking and writing all about my characters' pasts, changed something in the story. It messed with my characterization. I ended up with a barebones chapter that left contest judges (as well as the editor) scratching their heads over my characters' goals and motivations. Today is gorgeous in Florida. A bright blue sky, the air already warming up to hot . . . it's going to be beautiful. I'm also feeling good because something unprecedented happened. Something that is so rare in my line of work (toddler motherhood) that I'm late posting because of it. It could almost be called a miracle. 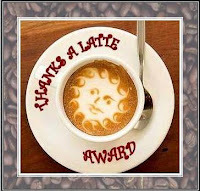 So now I'm postless, idealess, just sitting here, enjoying my coffee and the feel of a well-rested body. Many of you are posting about priorities. Today my sister is coming to visit and I feel great. I hope all of you have a good morning and that things fall into order in your life. :-) Have an awesome day, everyone! In the craft of writing, there's lots of potholes to avoid. Many of them have to do with distracting the reader. One of the things I have to watch out for in my writing is the echo. Ever heard of that? I hadn't, until a writer friend started pointing them out. Echoes are when you use a word repetitively in a short block of text, or even words that sound similar. While an echo can be used to make our work stronger (as in repetition for effect or emphasis), it can also weaken the work when used without thought. Here's a link for more information. My first job freelancing for a newspaper was awesome. I had to turn in two features a month. They were to showcase unique people in the community. Well, eventually my nineteen year old mind stuttered to a stop because I didn' t know how to find these "unique" people. So I asked my editor. I don't remember his precise words, but I got the gist and it opened my eyes. See, in high school I didn't see people. I didn't hear them. (Okay, unless it was a hot guy. LOL) My mind and my nose was always in a book. Every day I lived in a different world and only visited this one long enough to do my chores or my homework. I had minimal curiosity for the person next to me. Not so anymore. Because now I realize everyone has a story. My editor taught me that. People don't think they're special. I would ask around and almost everyone didn't think they were interesting enough for a three hundred fifty word feature. We know that using similes is a powerful tool in writing, but it's not just the act of thinking one up. A truly powerful simile or metaphor acts as an immediate image. A mood enhancer. Here's the prologue opening of Higher Hope by Robert Whitlow. "The afternoon thunderstorm thrashed Savannah with wet whips, the raindrops falling in waves that raced across the ground." When I opened this book, the first half of that sentence leapt out at me. The verb matches the noun. It sets an immediate tone, I think. Writers use imagery all the time, but does your simile match the mood of the scene? Does it evoke an image in a fresh way? I've heard of rain whipping through. But I've never read it described as a thrashing whip. Off the top of your head, can you think of any images or similes authors have used that stuck with you long after you'd finished the book? When writing, do you use certain images/similes to convey a specific tone? Congrats to T. Anne. You are the winner of Cheryl Wyatt's book Ready-Made Family! I hope you enjoy. Just send me your snail mail when it's convenient. Some cool links this week. First, Musetracks had an awesome contest where they took some pitches and are posting them for certain agents to peruse over and shop for. Still on the subject of pitches, Romance University posted an informative interview with author Lucinda McGary. I know some of you are attending conferences soon. You're working on your pitches and one-sheets. I've never really done either of those, and I'm planning to attend the ACFW conference in September. Any advice for me on this stuff?